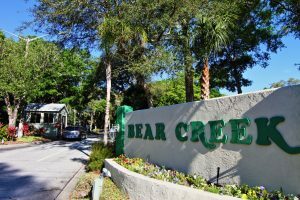 The manufactured homes for sale at Bear Creek in Ormond Beach, Florida, offer more than just an affordable way to enjoy fun in the sun and the fabulous beaches this area is famous for. Nestled in a gated community that’s sheltered by shade trees, the homes at Bear Creek come with an active lifestyle for the 55-plus set, both inside the gates and out. What’s more, in the unlikely event you run out of things to do at home, there’s plenty to explore outside the gates of Bear Creek. Where else can you find an affordable gated community that’s a short drive from miles of packed-sand beaches perfect for a long stroll, an international speedway, restaurants with fresh-off-the-boat seafood, and tourist sites like the Ponce de Leon Inlet Lighthouse, one of the tallest lighthouses in the nation? In addition, when you’re up for a day trip, you have only to drive an hour or two to reach world-renowned theme parks, professional and college sports venues, zoos, aquariums, historic sites, and more. You’ll see that the affordable manufactured homes for sale at Bear Creek in Ormond Beach, FL, make it more than a place to live – it’s a lifestyle! To find out more, contact our Lifestyle Team at Bear Creek today.